The Image 19.0 Q treadmill is probably Image's most impressive looking treadmill. But beware... its great packaging has fooled some into thinking that this is a quality treadmill, which it isn't. This treadmill is suited for those on a limited budget. If you can afford to buy a more expensive treadmill, this unit is not for you. You’ll be better off buying one of the $1,500 or above machine in our best buy treadmills page. Also, because of its poor quality, I don’t think this treadmill should be used for running. So unless you’re just looking for a treadmill you would walk on, I strongly urge you not to buy this machine. But if you really can't afford a mid-priced treadmill, at least settle for the Smooth 5.15P. It is currently our best buy entry level model. 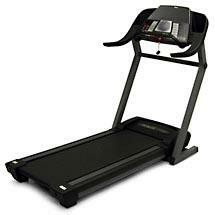 The Image 19.0 Q treadmill offers a 2.5HP motor (not continuous duty) which reaches speeds of up to 10 mph. It is also inclinable for up to 10%. And the Quick speed one-touch feature allows you to increase speed with a single touch of a button so you don't have to continually press the speed up button. The 55"L x 19"W treadbelt provides comfort and space for your workouts. But like most Image models, I don’t think the motor is powerful enough to handle the treadmill. Big tread belts need big motors. There are 6 pre-programmed workouts and each of them are built to challenge your body differently. You might also want to try the EKG pulse sensor of this treadmill. It tracks your pulse allowing you to workout in your target heart rate zone and burn more fats. The main problem with this treadmill is its quality. I don’t think that this model will last very long considering the cheap materials they used to manufacture it. If you do decide to buy one, be sure to put aside some money for future repairs or replacements. Don’t let the great packaging fool you into thinking this is a good treadmill. The Image 19.0 Q treadmill is not a treadmill you would want to buy. It has poor quality and to make matters worst, Image only offers a short 90 days warranty. So be prepared for some repair costs once the warranty is over. So to conclude, I don’t recommend this treadmill. If after reading this review you still plan on buying an Image 19.0 Q treadmill, I suggest you buy it at Walmart. They're selling it for $598.22.